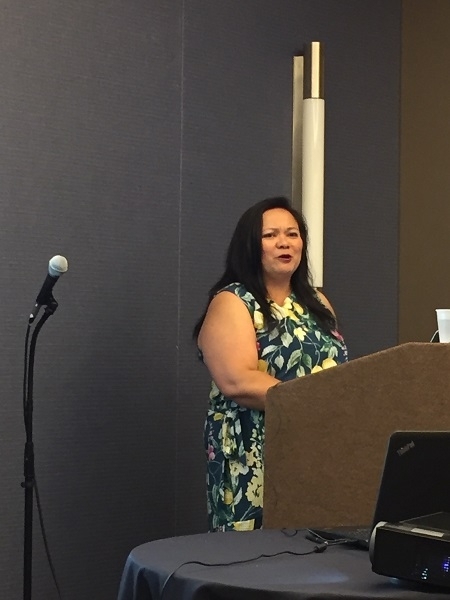 Grace Talusan greets attendees and introduces our session. 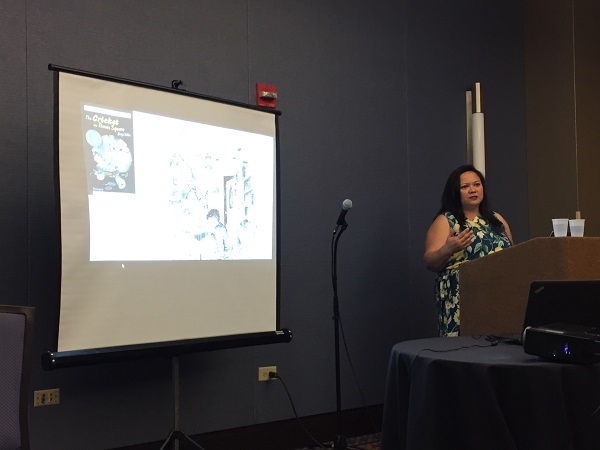 Grace talked about the images that she grew up with in children’s books and other media about Asian Americans, which were unflattering stereotypes. Grace and me after our session. We took turns sharing with our audience how our lives shaped our writing and how those memories, stories, and various documents of our lives fed our stories. We wanted the session to be interactive, so we engaged attendees on what stories they wanted to tell and tips on how to capture those stories. 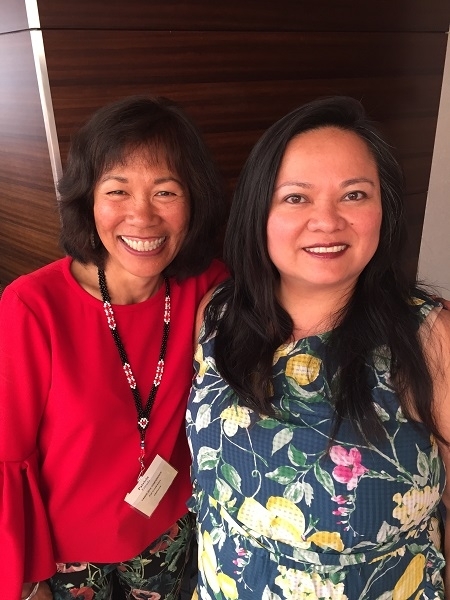 It was so nice to team up with Grace, whom I met when I was sending announcements about my book’s publication to various Asian American Studies programs at universities around the country. I’ve since gotten together with Grace when the Filipino-American Book Club of Boston read my book and on a whim I flew out to join them. Now I’m excited for her memoir to come out and for her to come out in February/March for a reading in Berkeley! Because I’d taken so much time off for our family vacation in June, I wasn’t going to be able to attend the entire conference. In fact, I flew in Thursday, presented, and then flew out Friday afternoon. It was a whirlwind trip. 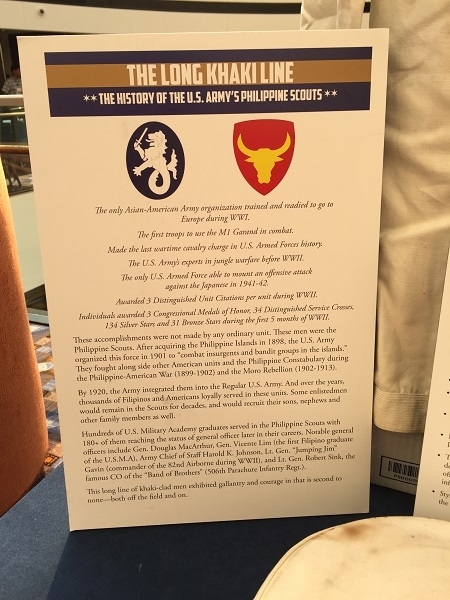 But I was able to see some great exhibits at the conference, including an impressive display on the history of the U.S. Army’s Philippine Scouts. This display charted the Scouts beginnings in a detailed timeline. Most impressive, however, are the uniforms and background on the different uniforms through the decades. 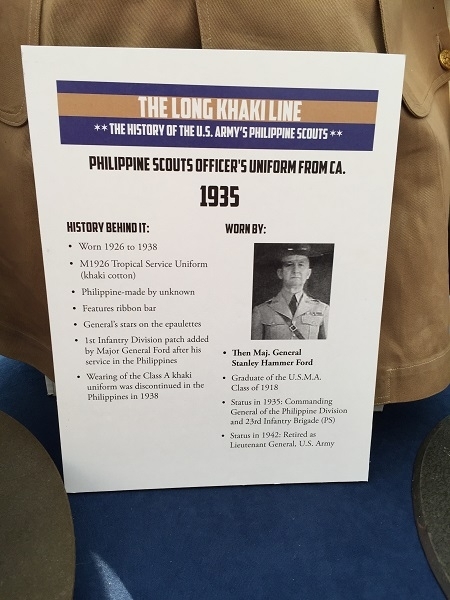 Display of the History of the U.S. Army’s Philippine Scouts, 17th Biennial FANHS Conference. 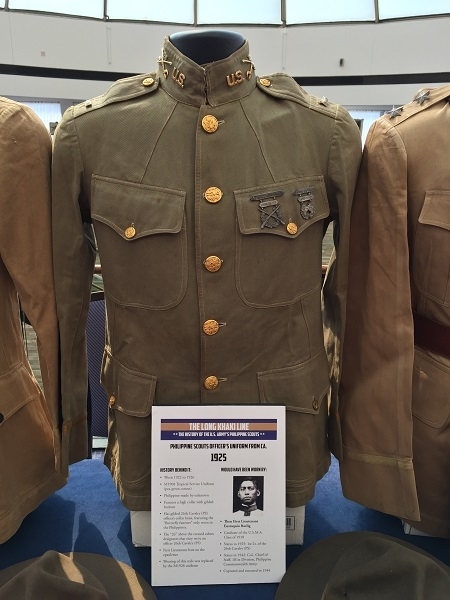 Details of this 1915 uniform in below, display of the History of the U.S. Army’s Philippine Scouts, 17th Biennial FANHS Conference. 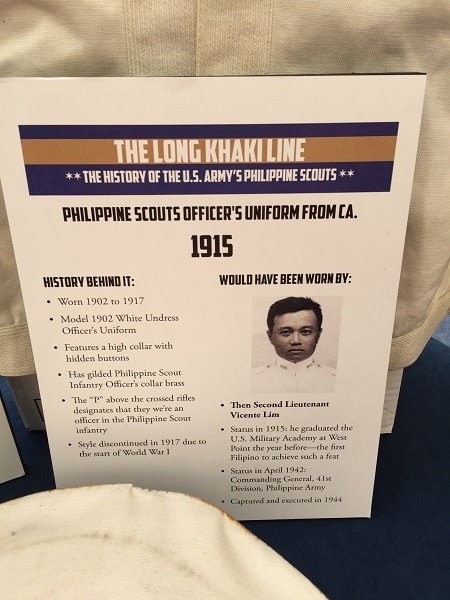 1915 Philippine Scouts uniform, History of the U.S. Army’s Philippine Scouts display, 17th Biennial FANHS Conference. 1917 uniform, History of the U.S. Army’s Philippine Scouts display, 17th Biennial FANHS Conference. 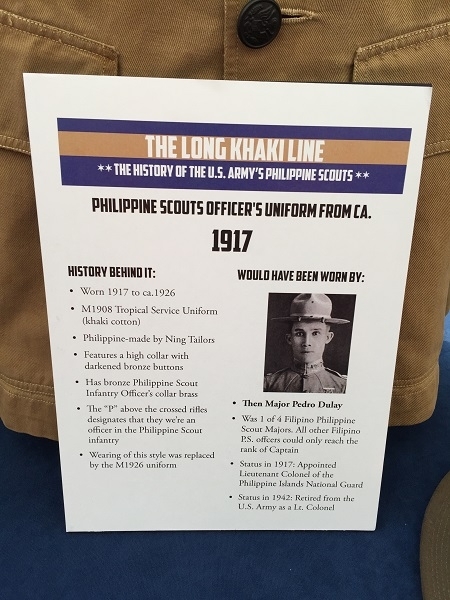 Historical information on the 1917 uniform, History of the U.S. Army’s Philippine Scouts display, 17th Biennial FANHS Conference. 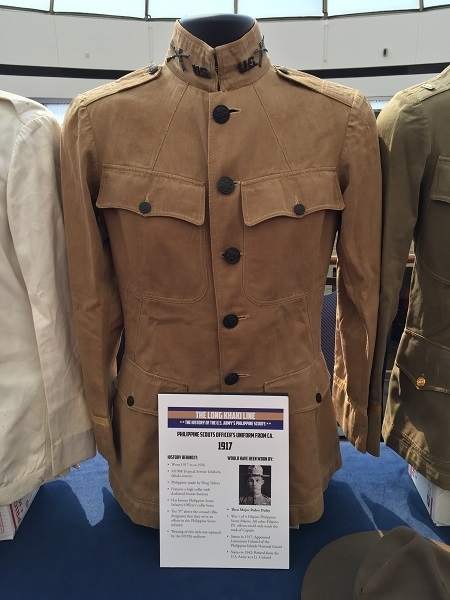 1925 uniform, History of the U.S. Army’s Philippine Scouts display, 17th Biennial FANHS Conference. 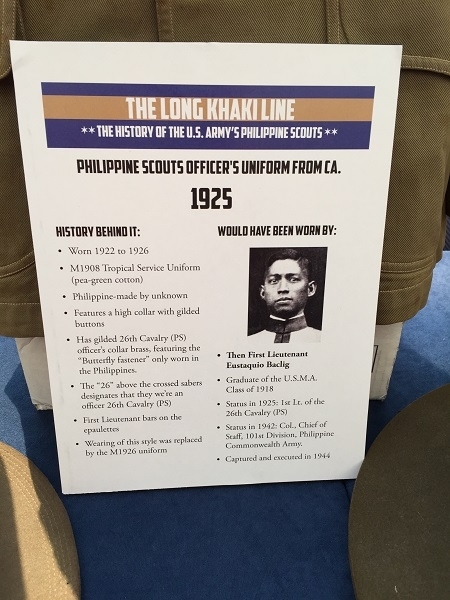 1925 uniform background, History of the U.S. Army’s Philippine Scouts display, 17th Biennial FANHS Conference. 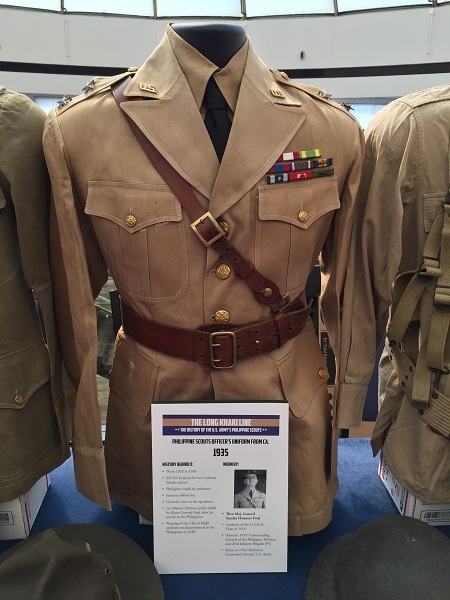 1935 uniform, History of the U.S. Army’s Philippine Scouts display, 17th Biennial FANHS Conference. 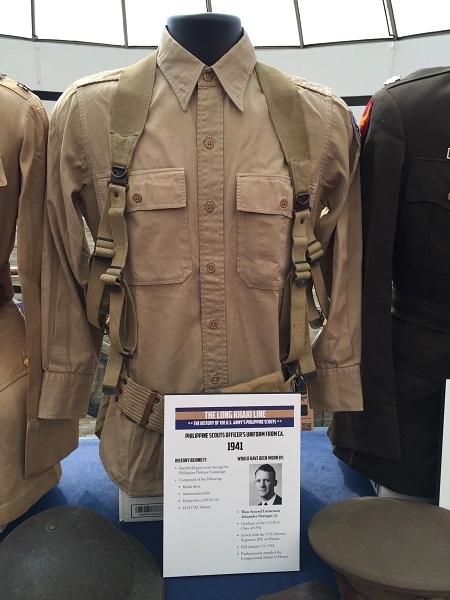 1935 uniform details, History of the U.S. Army’s Philippine Scouts display, 17th Biennial FANHS Conference. 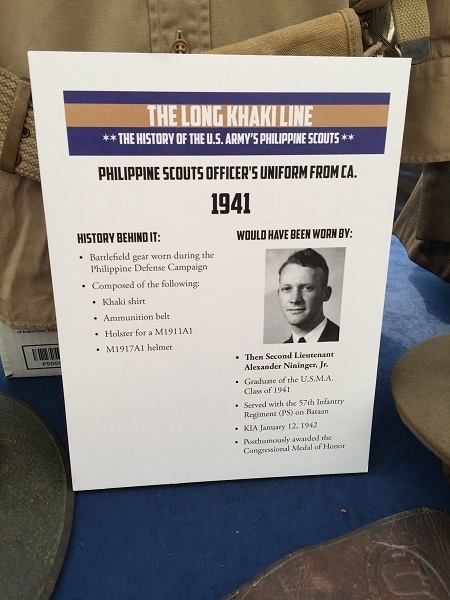 1941 uniform, History of the U.S. Army’s Philippine Scouts, 17th Biennial FANHS Conference. 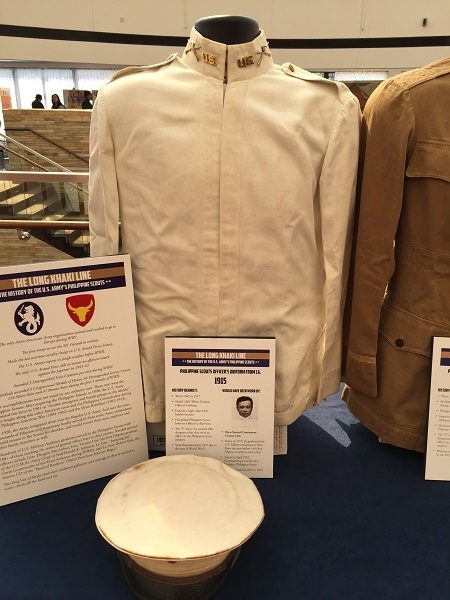 Details of the 1941 uniform, History of the U.S. Army’s Philippine Scouts, 17th Biennial FANHS Conference. 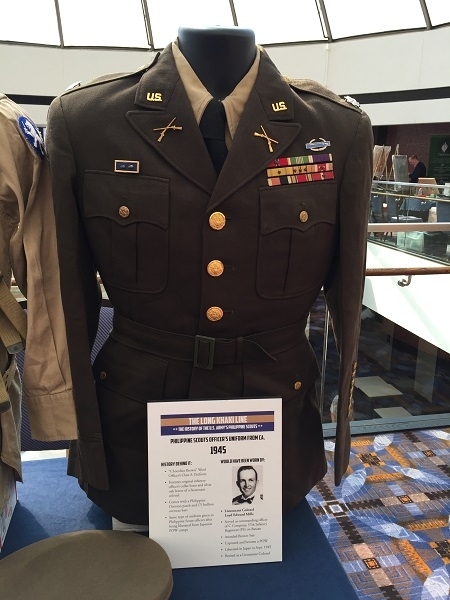 1945 uniform, History of the U.S. Army’s Philippine Scouts, 17th Biennial FANHS Conference. 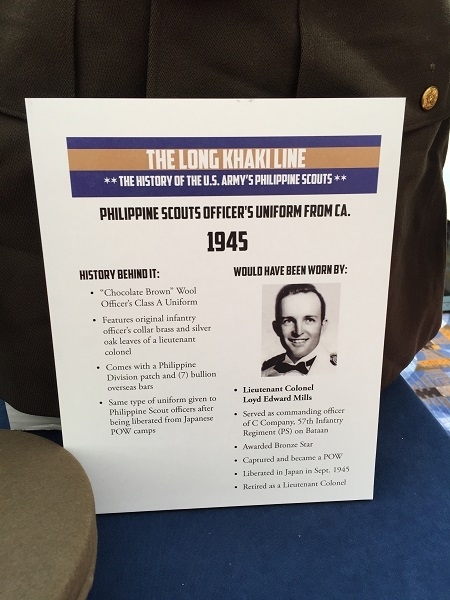 Details of the 1945 uniform, History of the U.S. Army’s Philippine Scouts, 17th Biennial FANHS Conference. I also caught up with colleagues whom I haven’t seen in a while. Although it was a short visit, I am glad I went to share my writing life and story, but, more important, to spend time, however short, with friends. 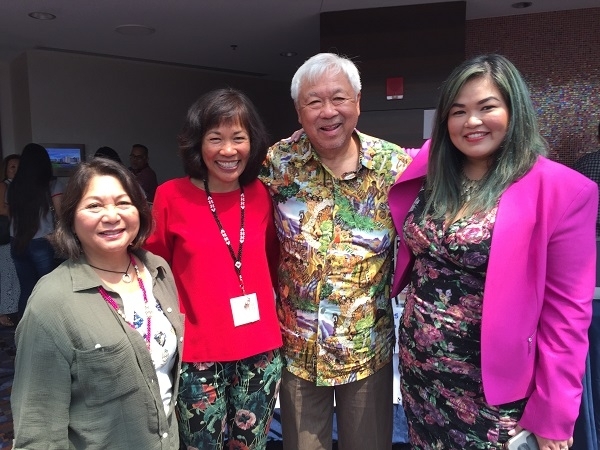 the 18th Biennial FANHS Conference will be in Hawaii, July 1-4, 2020. A few of us talked about putting together a great panel session. I hope to make it to my third FANHS conference. 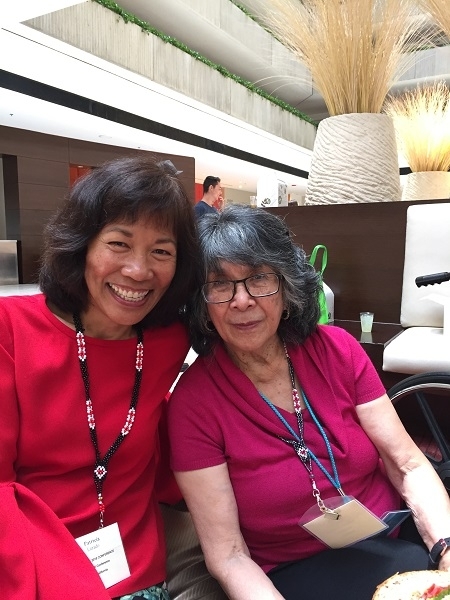 It was great to meet up with Vickie Santos, past president of the East Bay chapter of FANHS, and her amazing 96-year-old mother, who was very active politically in Chicago for decades. 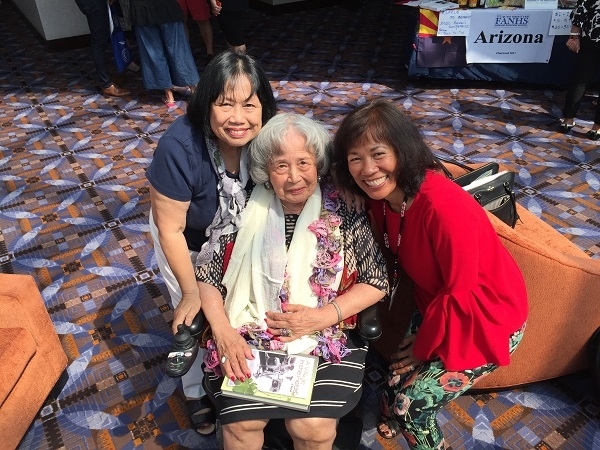 Vickie and her mother, Connie, co-wrote, Memoirs of a Manang: The Story of a Filipina-American Pioneer. Happy to have seen Maria Batayola, community and social justice activist, at the FANHS Conference. Maria was my wonderful host when I had a book tour in Seattle and Yakima Valley in October 2016. 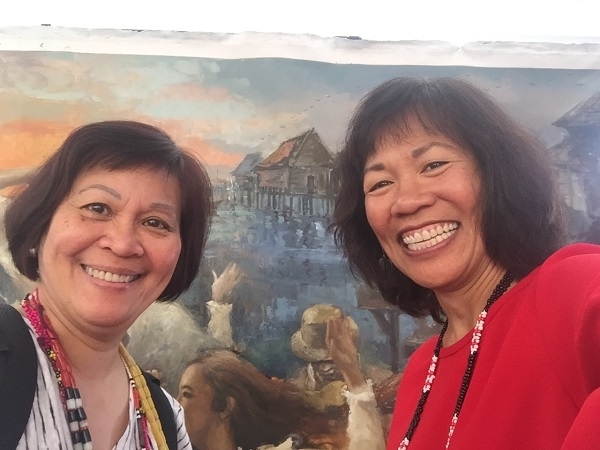 We’re standing in front of a huge mural of a Filipina scene. I spend part of lunch talking with Dorothy Cordova, who founded FANHS with her late husband, Fred Cordova, in 1982.